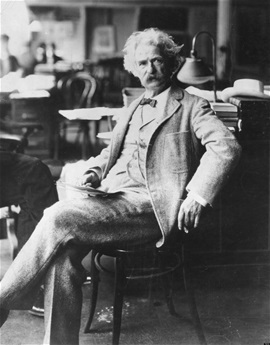 Mark Twain wrote "The Entertaining History of the Scriptural Panoramist" in 1866. 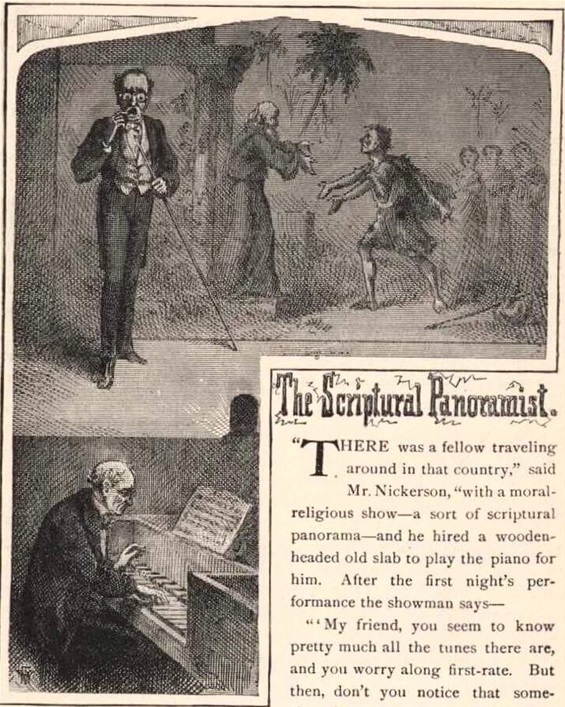 The story is about a religious moving panorama showman who, having lost his musical accompanist, unknowingly hires the local drunk to play the piano for his religious show. At the most inappropriate moments, the pianist launches into bawdy drinking songs to the horror of the panoramist and the delight of the audience. Enjoy! "My friend, you seem to know pretty much all the tunes there are, and you worry along first-rate. But then didn't you notice that sometimes last night the piece you happened to be playing was a little rough on the proprieties so to speak - didn't seem to jibe with the general gait of the picture that was passing at the time, as it were - was a little foreign to the subject, you know - as if you didn't either trump or follow suit, you understand?" "Well, no," the fellow said; he hadn't noticed, but it might be; he had played along just as it came handy. So they put it up that the simple old dummy was to keep his eye on the panorama after that, and as soon as a stunning picture was reeled out, he was to fit it to a dot with a piece of music that would help the audience get the idea of the subject, and warm them up like a camp-meeting revival. That sort of thing would corral their sympathies, the showman said. There was a big audience that night - mostly middle-aged and old people who belonged to the church and took a strong interest in Bible matters, and the balance were pretty much young bucks and heifers - they always come out strong on panoramas, you know, because it gives them a chance to taste one another's mugs in the dark. "Ladies and gentlemen, the painting now before you illustrates the beautiful and touching parable of the Prodigal Son. Observe the happy expression just breaking over the features of the poor suffering youth - so worn and weary with his long march: note also the ecstasy beaming from the uplifted countenance of the aged father, and the joy that sparkles in the eyes of the excited group of youths and maidens and seems ready to burst in a welcoming chorus from their lips. The lesson, my friends, is as solemn and instructive as the story is tender and beautiful." When Johnny comes marching home!" Some of the people giggled, and some groaned a little. The showman couldn't say a word. He looked at the piano sharp, but he was all lovely and serene - he didn't know there was anything out of gear. "Ladies and gentlemen, the fine picture now unfolding itself to your gaze exhibits one of the most notable events in Bible History - our Savior and his disciples upon the Sea of Galilee. How grand, how awe inspiring are the reflections which the subject invokes! What sublimity of faith is revealed to us in this lesson from the sacred writings! The Savior rebukes the angry waves, and walks securely upon the bosom of the deep!" And a home on the rolling deep!" There was a good deal of honest snickering turned on this time, and considerable groaning, and one or two old deacons got up and went out. The showman gritted his teeth and cursed the piano man to himself, but the fellow sat there like a knot on a log, and seemed to think he was doing first-rate. "Ladies and gentlemen, this exquisite painting illustrates the raising of Lazarus from the dead by our Savior. The subject has been handled with rare ability by the artist, and such touching sweetness and tenderness of expression has he thrown into it, that I have known peculiarly sensitive persons to be even affected to tears by looking at it. Observe the half-confused, half-inquiring look, upon the countenance of the awakening Lazarus. Observe, also, the attitude and expression of the Savior, who takes him gently by the sleeve of his shroud with one hand, while he points with the other toward the distant city." And go along with me!" It was rough on the audience, you bet you. All the solemn old flats got up in a huff to go, and everybody else laughed till the windows rattled. "That lets you out, you know, you chowder-headed old clam! Go to the door-keeper and get your money, and cut your stick! - vamose the ranch! Ladies and gentlemen, circumstances over which I have no control compel me prematurely to dismiss - "
"By George! it was splendid! - come! all hands! let's take a drink!" It was Phelim O'Flannigan, of San Luis Obispo, who interrupted. I had not seen him before. "What was splendid?" I inquired. Our party clinked glasses once more, and drank in respectful silence.